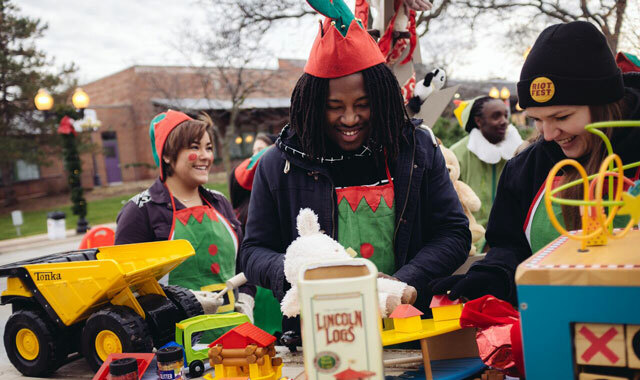 Rockford’s merriest and brightest event of the year is back on Nov. 26. Discover what to expect at this year’s Stroll on State festival. Stroll on State kicks off the Christmas season on Nov. 26. Stroll on State, a holiday festival that brings more people to downtown Rockford than any other single-day event, will once again kick off the Christmas season. The much-anticipated annual event brought an estimated record of 66,000 people to downtown Rockford last year. It returns for its fourth year from 3-9 p.m. on Saturday, Nov. 26, two days after Thanksgiving. Festivities commence mainly along State Street in downtown Rockford, but activities are spread throughout 20 blocks. Illinois Bank & Trust is the presenting sponsor of this free, family-friendly event. Visitors can stroll on State Street, from Third Street to Main Street, while witnessing the sights, sounds and smells of the holiday season. When Stroll on State started in 2013, more than 30,000 people attended. Because of last year’s staggering attendance numbers, event organizers want to keep the event fairly consistent with last year. Daytime activities include outdoor and indoor ice-skating at the Riverview Ice House, 324 N. Madison St. and horse and wagon rides. At Santa Land, guests are transported to Santa’s North Pole workshop. Kids can watch elves work on toys for the season while they wait to meet Santa. Kids can also get up close and personal with Santa’s reindeer. Two outdoor markets are taking place: one at the corner of North Main and Mulberry streets, and another at the City Market Pavilion, 212 N. Water St.
One of the more popular events is the lighting of the city Christmas tree at the corner of West State and Wyman streets. The lighting is followed by a fireworks display over the Rock River. Another featured attraction is the Fire and Ice presentation, along with Randy Finch and his Ice Brigades crew. Throughout the night, blocks of ice are transformed into a variety of sculptures and creations. Families can gather for a group photo inside Chase Bank, 401 E. State St – a perfect way to preserve the evening’s memories. “We’ve been thrilled at the response Stroll on State has received and we are grateful for our sponsors, partners and volunteers who help us maintain Stroll on State as a free event,” Vettore says. In addition to Stroll on State activities, downtown businesses accommodate guests with food, drink and shopping opportunities as part of Small Business Saturday, the same day as Stroll on State. Volunteers are already hard at work preparing decorations for the event. Volunteer work days, called Santa’s Workshops, are taking place from 8:30 a.m. to noon every Saturday morning and from 5:30 to 9 p.m. every Tuesday evening. The workshops take place at 120 N. 3rd St., on the corner of East State and Third streets. Children ages 12-15 may volunteer with an adult and a signed waiver; 16- and 17-year-olds must provide a signed waiver. Visit strollonstate.com for more information or to sign up to volunteer. This entry was posted on Monday, October 10th, 2016 at 11:58 am	and is filed under Arts & Entertainment. You can follow any responses to this entry through the RSS 2.0 feed. Both comments and pings are currently closed.